When my kids are sick, I really try to push the fluids. 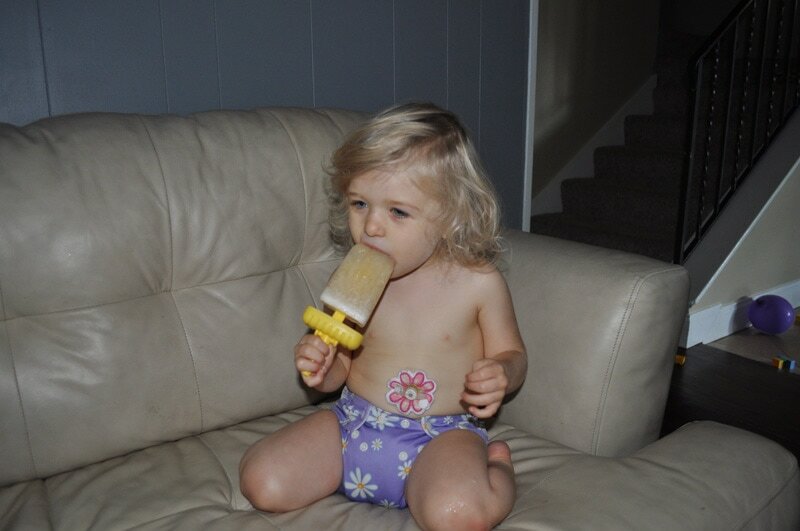 They will almost always eat popsicles. So why not create a popsicle replacement for Gatorade and Pedialyte? This couldn’t come at a better time since everyone is going back to school. Let’s face it, that is where the kids bring home most of their sickness. Especially around the age that my girls are. According to Livestrong, “The body depends on electrolytes such as, chloride, sodium, potassium and magnesium.” You can get these things in nature with no need for synthetic drinks like Gatorade and Pedialyte. Milk (in my case we used oat milk), can provide calcium and protein. One banana contains about 422 mg of potassium and 32 mg of magnesium. Coconut water contains small amounts of sugar and also sodium that the body needs to replenish electrolytes. Lemons contain calcium, potassium, magnesium and trace amounts of sodium making them perfect for natural electrolyte replacement. I chose to do mine in a popsicle form because most kids will soothe a sore throat with a popsicle. If you want to give these pops an added boost, you can add 1/2 tsp of cinnamon. Cinnamon and raw honey mixed together can help a cold. You can also skip the popsicle molds and serve this as a drink too. As you can see here, they are kid approved. This is how we roll in the Texas heat! Mix everything together in a blender and blend for 2 minutes. 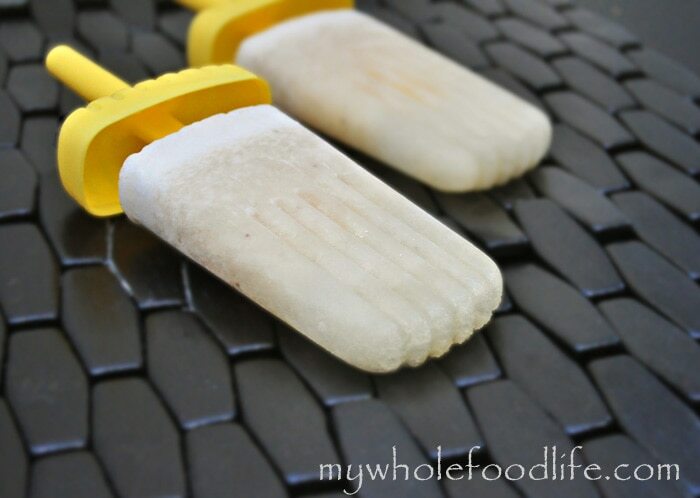 Pour into popsicle molds . After about 6 hours they should be ready to eat. I got 5 pops out of my recipe. That’s it. Enjoy! I have never heard of oat milk. What is it and do you make it? You can use whatever milk you like. My daughter is allergic to milk and soy, so I use oat milk. If you want to get the oat milk, you can find it at most health food stores. fabulous idea!!! I'm allergic to coconut though. What would you recommend to use in its place? Thank you! You can try using the juice of an orange, but coconut water is a pretty key ingredient in here. I love this idea - such a perfect solution! I'm sure my family wouldn't even miss the sports drinks if I kept these on hand! I will definitely have to give them a try!!! I bought them here. http://tubiewhoobies.com/ They are awesome and they even do custom orders! I have never had one fall apart yet. I just throw them in the wash with the rest of the clothes. This is a fantastic idea - I'm keeping it! Coconut water is a natural electrolyte replacement. I am not sure if coconut milk would be a suitable replacement. If you are just enjoying them to eat, you can use coconut milk. If you are using as an electrolyte replacement, use the coconut water. You can find it at the health food stores usually with all the flavored waters. Yes that is correct. Thank you for reminding me. I am editing the post now. I make an electrolyte drink using raw honey, lemon juice, sea salt & baking soda (and water of course). How do you think a small amount of baking soda would be added to this? Or is it even needed in your recipe? I don't know. What does baking soda do in your recipe? I'm curious. Hi Darinka! Thank you! Yes, it is important not to give a child under 1 raw honey because of the botchalism. As adults, our bodies can process it okay, but babies are too little and it could make them sick. What could I use in place of a banana? My son and I are allergic. Thank you! You can try apricot or squash? Both are high in potassium as well. Maybe 1/2 cup? I'm definitely making a batch of these, but I'm not sure my four year old will go for the flavor. Do you think I could add some strawberries to this? I love the popsicle idea! I make a similar "gatorade" as my kiddos call it, with maple syrup, lemon juice, baking soda, sea salt, water. I want to make these for my 17 month old. I only have "regular" honey on hand, not raw. Would that be okay? Or should I sub it with something or leave it out? That would be fine. I use raw because it contains the benefits, but you can use regular if that is all you have on hand. Hi Melissa! I did some research in the past year about alternative drinks that we could use during endurance sports activities. I was hopeful about coconut water, but from everything I read it only has small amounts of sodium, which makes it a no go for a stand alone replacement. It does have a good amount of potassium--but most athletes that use it add salt to it. We chose not to do that because I'm not a huge fan of coconut water by itself, so I couldn't imagine what it would taste like with added salt! I noticed in your write-up, you said that coconut water was a good sodium replenisher--so I just wanted to share what I learned. Thanks for all your good recipes! Made the pesto portabellos again last night and they were fabulous as usual! Thanks Heather! I actually add salt to mine now. I do hot yoga and a lot of people turned me on to adding salt as well. My latest drink consists of coconut water, a whole lemon, pineapple juice and salt. In our area we have just come out of a LONG stretch without rain, and we've had some of the hottest summer temperatures ever! These popsicles were practically a necessity. :) They are approved by my 8-year-old daughter. So glad she loves them, thank you Melissa! Pingback: Skint Dad's homemade sniffle sorter-outers!